Heat the oil in a deep-fat fryer until it reaches 190°C. To make the batter, sift the white flour blend, cornflour and a pinch of baking soda into a bowl and make a well in the centre. Pour in the sparkling water and vinegar and mix well with a whisk. Leave the batter to rest while you prepare the prawns. Prepare the prawns by removing their head and shell from the tail or ask your SuperValu Fishmonger to do this for you. Place in a large bowl with the coriander, lime zest and juice and a pinch of salt. Gently mix by hand until all the ingredients are incorporated. Drain any excess liquid from the prawns, then sift in the flour and mix gently, ensuring all the prawns are coated in the flour. 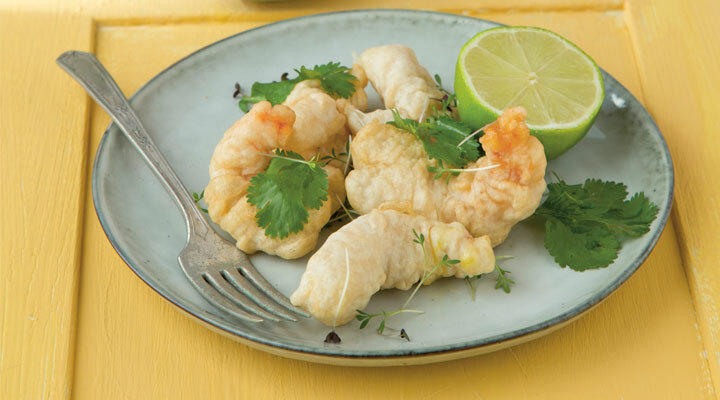 Shake off any excess flour before adding the prawns to the batter. Using a fork, carefully remove five prawns from the batter, shaking off the excess batter. Place the prawns in the deep-fat fryer and cook for 4 minutes, until golden brown, then drain on a plate lined with kitchen paper. Repeat the process for the remaining prawns. Serve immediately with lime wedges, red onion marmalade, mango mayonnaise and seasonal salad leaves. Peel and chop 2 fresh mangos and place in a blender with 250g SuperValu mayonnaise, the juice from ½ lemon and a pinch of sea salt. Blend until smooth. Whisk in 1 tablespoon of white wine vinegar to loosen the mixture at the end. Store in a sterilised jar in your fridge for up to one week.